I don’t know about you, but I always welcome the end of summer garden chores and food preservation. Saying farewell to the general busyness of keeping up with it all feels like a relief. Sure, I’m sad to say goodbye to sandals, shorts, and tomatoes. But I’m also ready for the kale (kale, kale, and some more kale) our northwest climate offers in abundance. Yes, this time of the year is often full of angst and more than a few tears. It is the beginning of the end people. The start of incessant and relentless rain. A dehumidifier that never stops. Mud everywhere. Frequent crying jags. Seattle + Winter ≠ Happily Ever After for Meg. Thanks Gayla for feeling my pain. The garden though. You aren’t here for my inner weather neurosis. 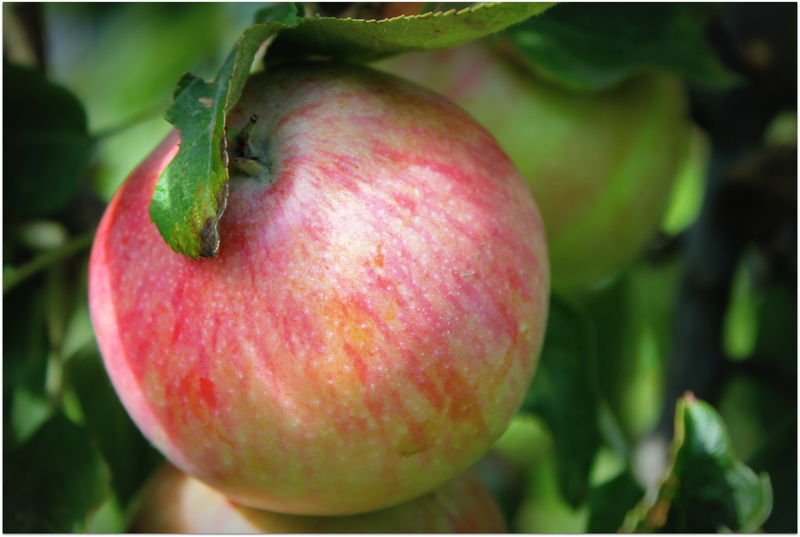 The Scarlet Sentinel apples are perfect right now. Sweet, crisp, and just the right size! The asparagus patch has started the annual die back. I leave them in till they are completely dead as the birds really like to hang out in there and nibble on things. A few last fall-bearing raspberries are still ripening. The garlic is in and soil covered with the most amazing chicken manure compost, followed by a generous layer of partly composted straw from the chicken run. 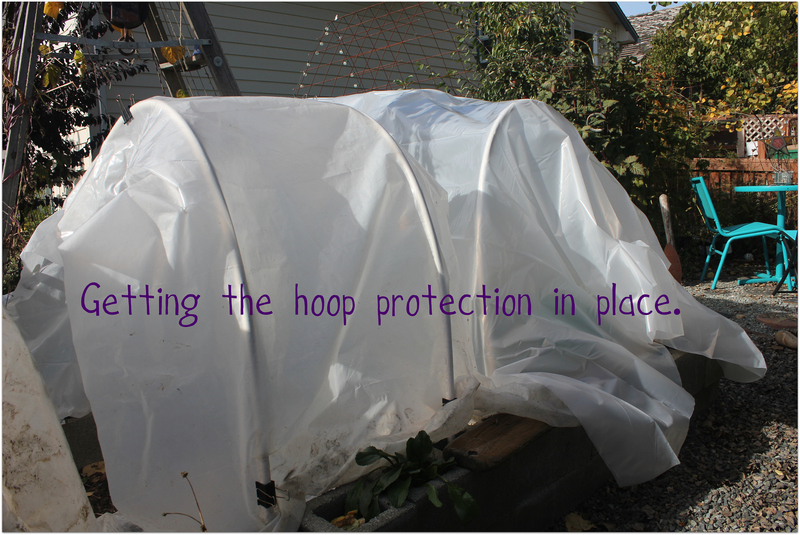 I’ve pulled out the plastic sheeting that covers our hoop house and gotten it in place. The winter garden to be has been in place for some time now. 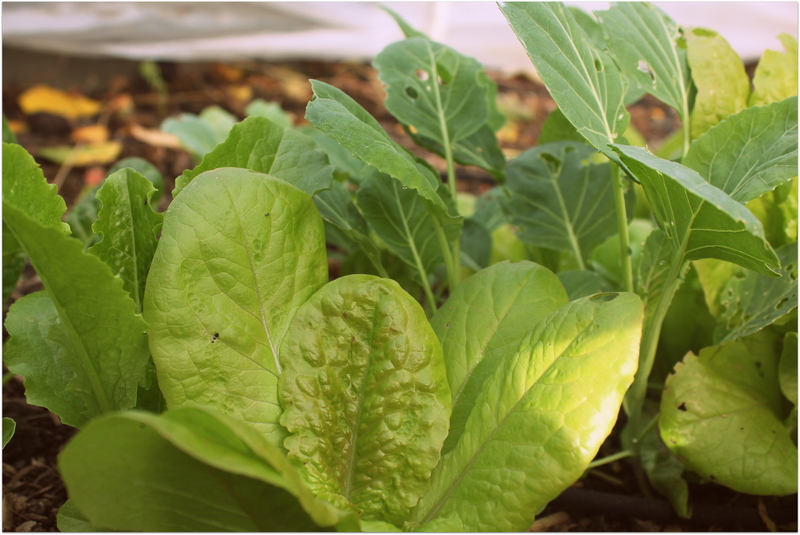 but continues to grow and it seems like we will have healthy crops of chard, kale, lettuce, arugula, and beets. 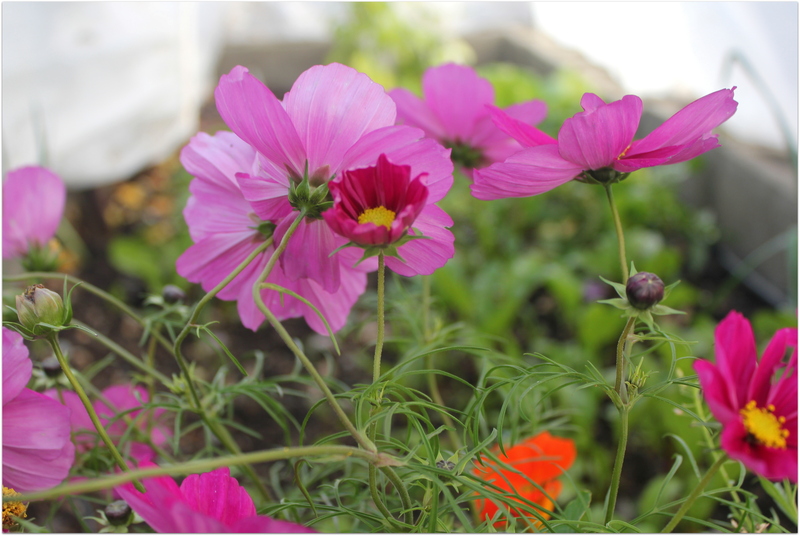 Beautiful cosmos and nasturtiums are still blooming in the raised bed edges. Lots of mixed lettuces and kale. 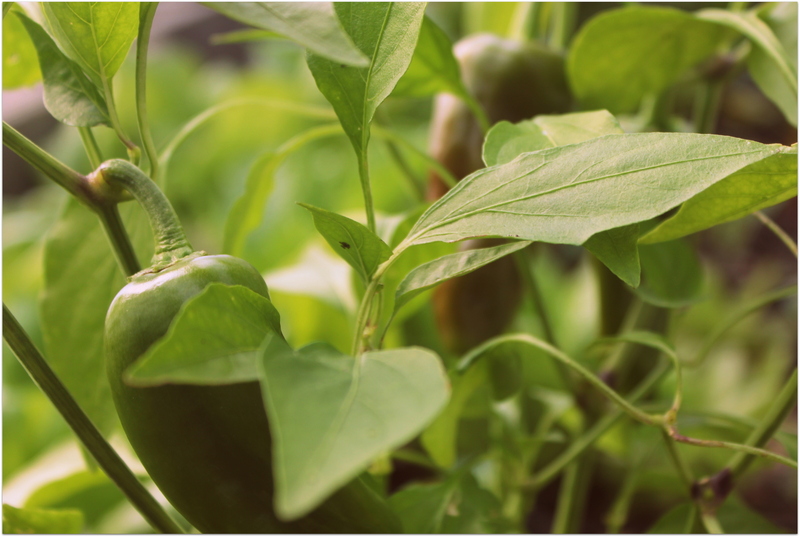 A few last ripening hot peppers. It was a banner pepper summer! 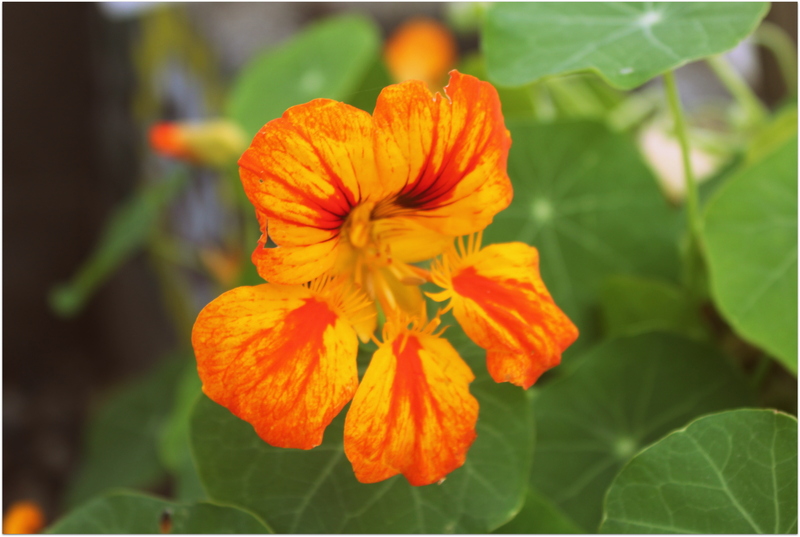 The nasturtiums just won’t quit. They are nothing if not resilient! 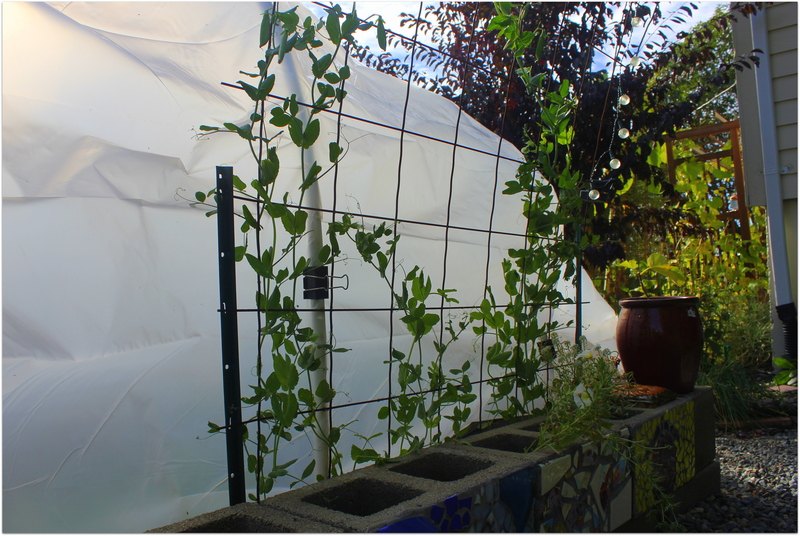 This is the first time I planted fall peas, but they they are growing and tasting well. I tucked the hoop house coverings behind them so they still are growing up, up, up. I pulled our strawberrries out this year. They have been there 6 years and even with good pruning their output is decreasing. They were also a mix of both june-bearing and everbearing and we are going to plant primarily june-bearing next summer. So, they are out and the blueberries are mostly tucked away. 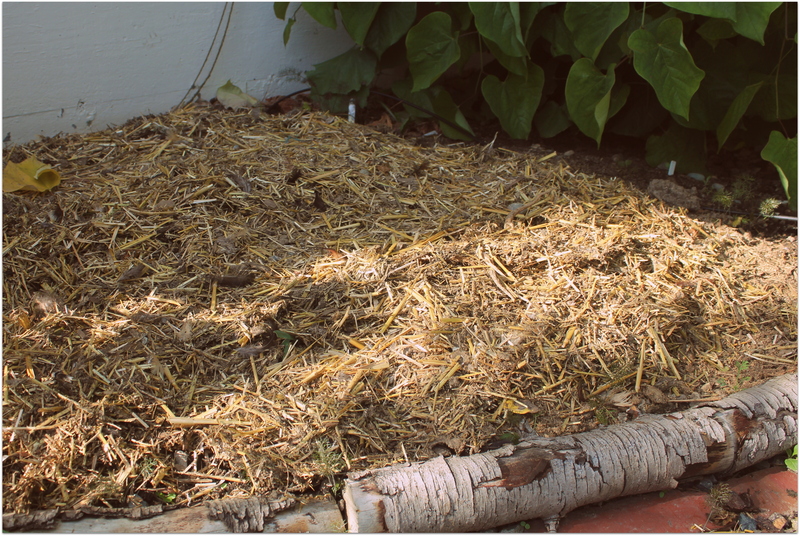 The chicken compost is on and the beds are awaiting the final layer of straw-poop mixture from the run as mulch. The sweet chickens are still molting and putting out only a few eggs. I haven’t put in lights on a timer yet, but I better getting on it stat or we are about to be Eggless in Seattle for the winter. Daddy, our silver-laced wyandotte hen is the only one that doesn’t appear to be molting at all. Isn’t she a beauty? 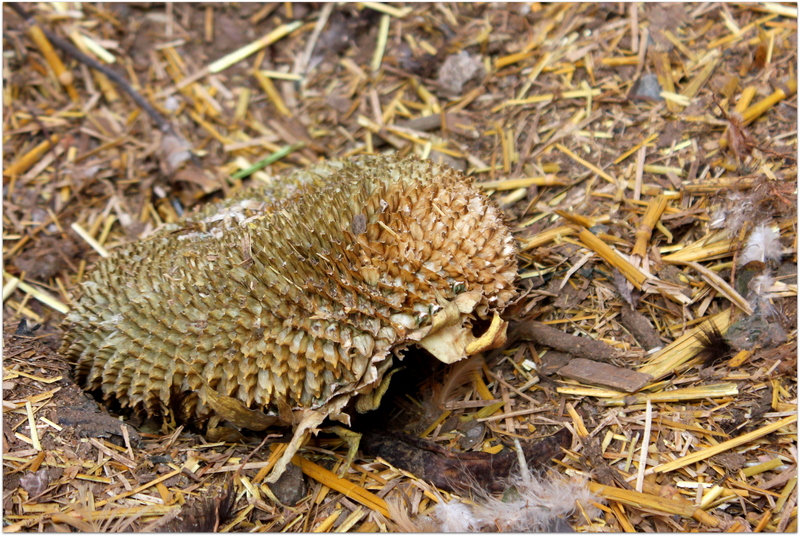 One of the Annies– she is undergoing a slow, or minimal, molt. The other Annie is looking a bit rougher. You can see she has lost a fair amount of feathers to her chest and neck. 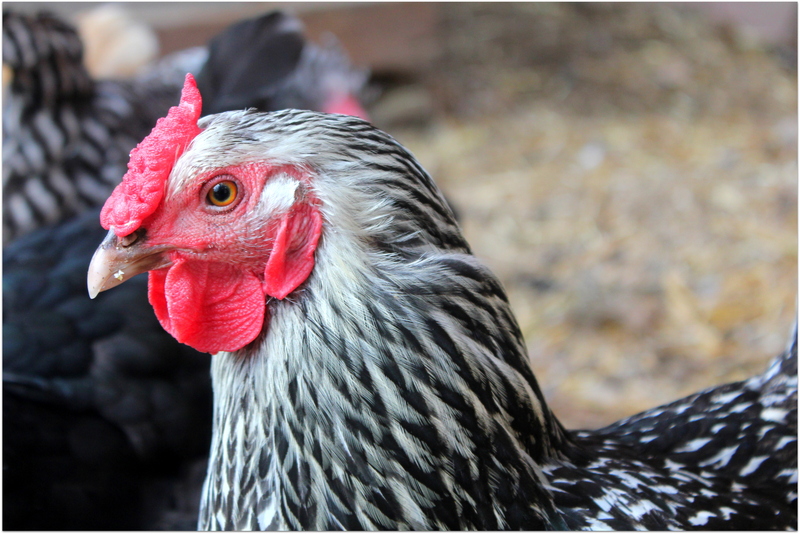 Spent sunflower heads are a chicken favorite and offer up some extra protein. 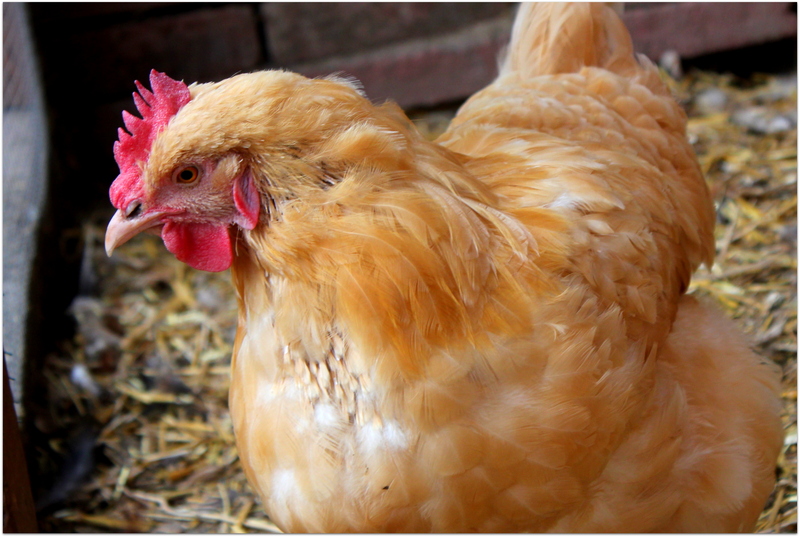 Chickens need extra protein during molting season to rebuild their feathers. 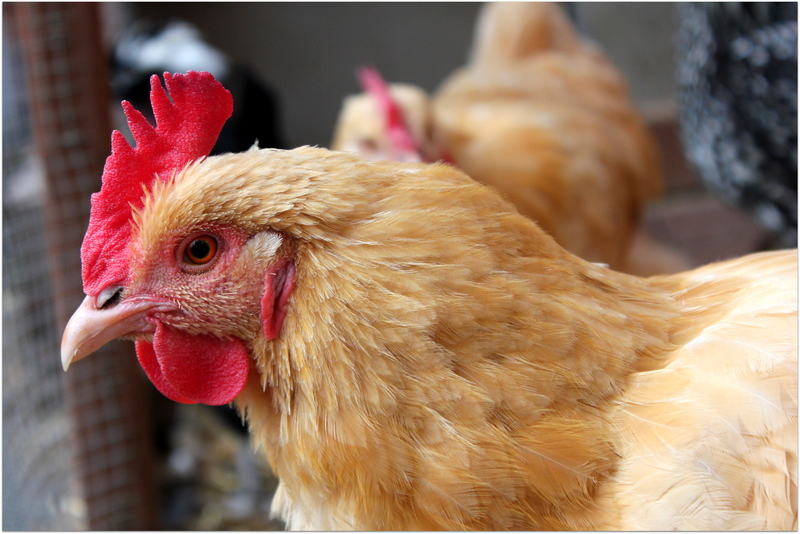 Feathers are primarily feathers and eggs are primarily protein. This is why they usually stop (or slow down) laying during their molt. They need that all that egg laying protein for feather growth. A few winter prepping chores are left to complete. I need to get gutters up on the summer-remodeled coop. The coop could use a good going-into-winter cleaning. 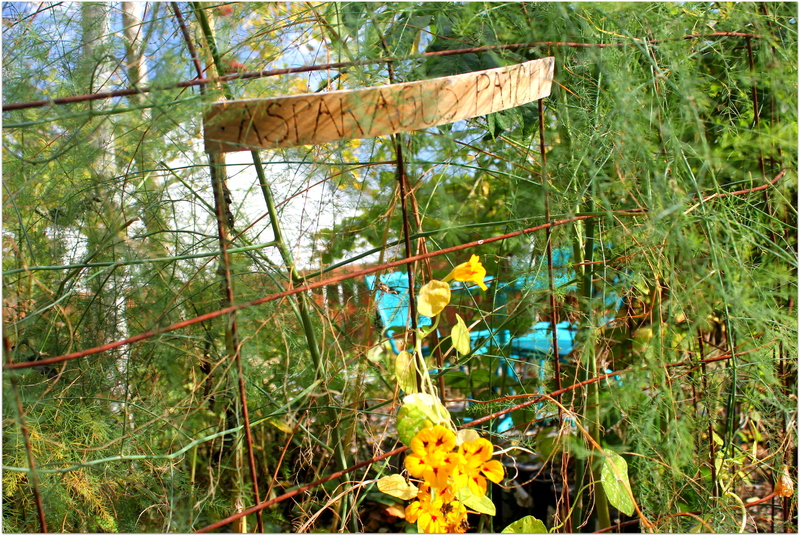 A bit more chicken run mulch will be placed around- primarily around the berries and asparagus once they are cut back. Then, I’m staying dry and working on my business for spring! Link to past Mid-Month Meanderings. 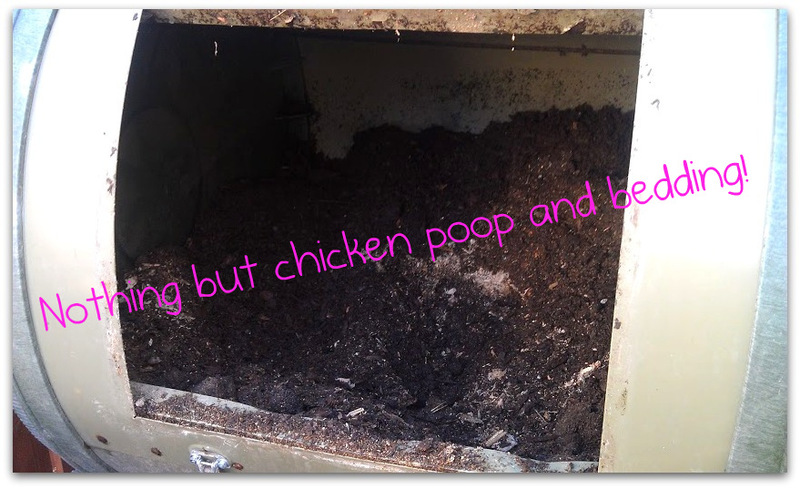 This entry was posted in chickens, Garden and tagged 2012, buff orpington, chickens, hoop house, mid-month meanderings, molting, october, silver laced wyandotte. Bookmark the permalink. 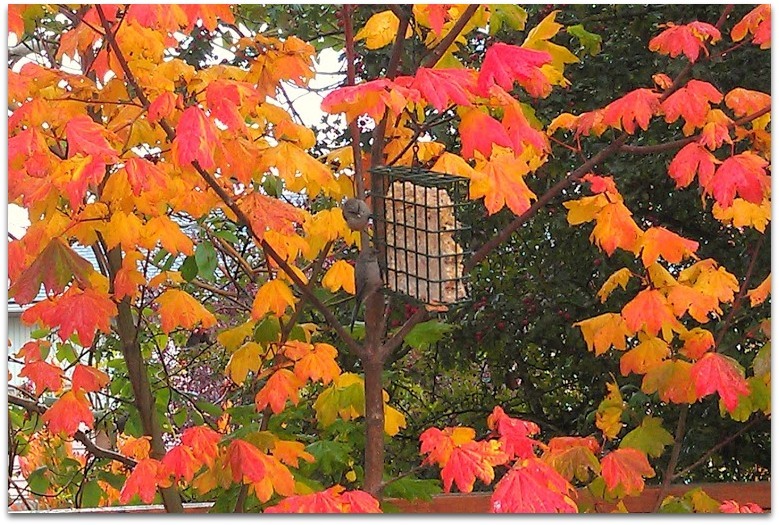 I feel the same way about Autumn, even though we generally don’t get QUITE as much rain down here. But my house is severely under-insulated and under-heated, and we all freeze our asses off while paying $350 PG&E bills all winter. It is so not happy. The only compensating benefit is the return of soup season. Also, my garden always look like a hot mess this time of year, partly because I have burned out on gardening and want nothing to do with it. Yours looks lovely and well-kempt. I love reading your mid-month meanderings. I was thinking about getting a columnar tree, but didn’t because I already have a couple mini-dwarf apple trees and have a really small yard. Dang it if I’m not drooling over those Scarlet Sentinels though. Thank you! 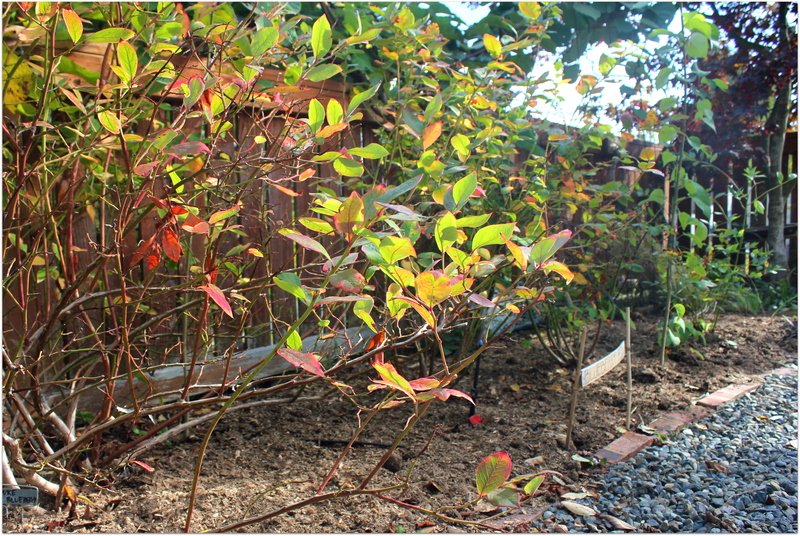 The trees are really perfect because of the upright habit and that you can grow them just 2 feet apart or in pots. I love them! Looking lovely! I don’t mind the rain anymore but it took me years to get used to it. I just rebuilt my garden beds (read: had them rebuilt) because they had crumbled to nothing–am I too late to plant anything this year here in Seattle? 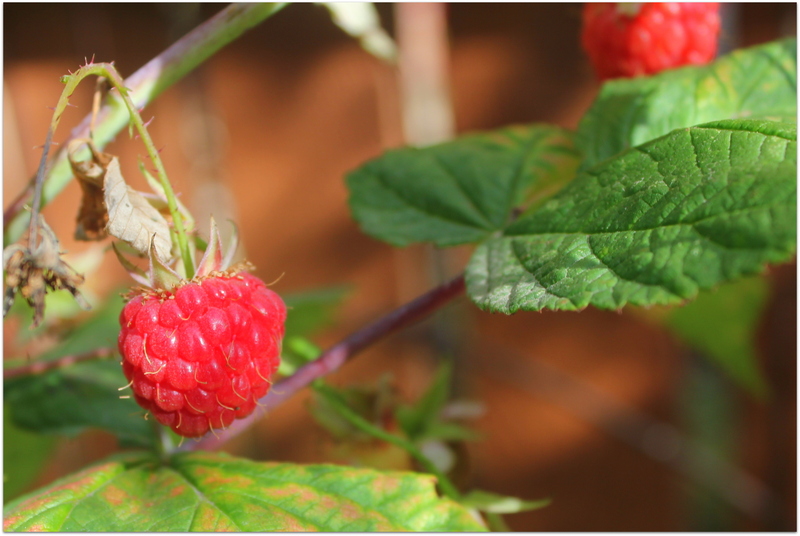 I am going to put in raspberry canes, which I’ve been wanting for years, but I haven’t figured out the veggie beds yet–usually anything I was planning to overwinter would have been in for a while by now!